Over the weekend, the GW in Bowie, MD held an Iron Painter challenge: a 24-hour long painting competition. They had several catagories you could choose from, including painting a 2,000 point army (Hubs' choice), a force from a starter set, an allied detachment, a monstrous creature, a tournament display board, or a warband of at least 12 models. I initially wanted to paint my Space Wolves, but with the holidays I didn't have enough time to finish their conversions. Instead, I chose to do a warband, as some friends and I are starting up a Necromunda campaign soon. The models didn't arrive until two days before the event (much to my panic) because of a GW snafu, but they overnighted them to me. I had enough time to scrape, convert, and prime them so all was well in the end. Photos weren't taken with my usual set up, but I think they turned out pretty well just the same. That's most of the gang. My gang, so far, has 14 models total. I won't need that many at first, but I wanted to get enough that I could expand the gang as the campaign continues. If you've never done an Iron Painter- do it if you get the chance. It was a great time and I got a heck of a lot of painting done with minimal distractions (and only a little bit of brain damage from sleep deprivation). For a while there, I didn't think I'd make it all the way through the night, but I did. It was 24-straight hours of hanging out with fellow hobbyists and having a good time. We met some nice people and it was definitely better than just sitting at home painting. The important part was to pace myself and do some of the "trickier" things while I still had a steady hand (and a steady mind). I painted all their flesh first and then went straight to doing their eyes because I knew there was no way I could do the whites and then dot their eyes at the wee hours of the AM. Every hour throughout the night, I tweeted a picture of my progress. Initially, it was just to help me make sure I was on track time-wise and to document my progress, so I didn't get bogged down on any one part for too long. But then it turned into this wonderful, fantastic thing because a lot people who follow me really got into it. They were tweeting me encouragement all night long, and it was quite amazing. I appreciate all the love you showed me, it made the night go by a lot faster! Now for the fun part- the finished product! 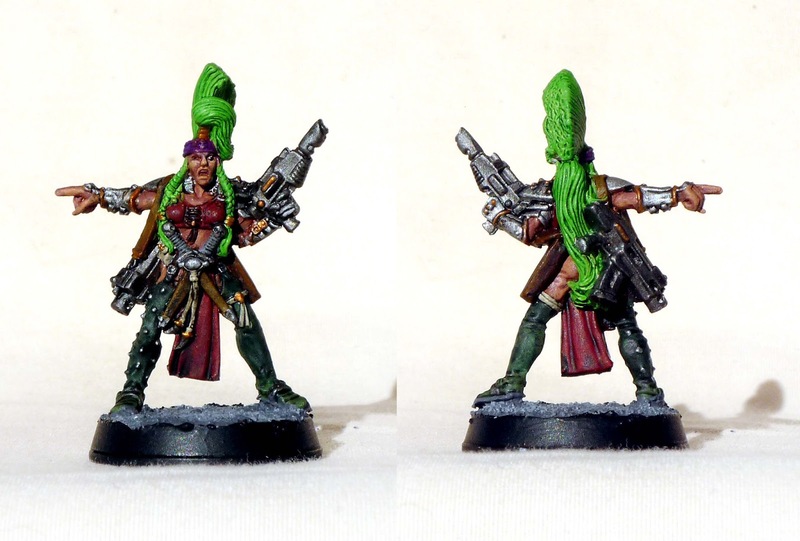 These Escher gang ladies have some pretty outrageous hairdos, but they were incredibly fun to paint. It's not too often that you get to use some of the more vibrant colors available, so I took this opportunity to make the most of their hair. My favorite one, with a Dark Elf sword. 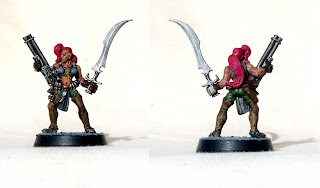 This is the first model I finished during the Iron Painter, and she's definitely my favorite. 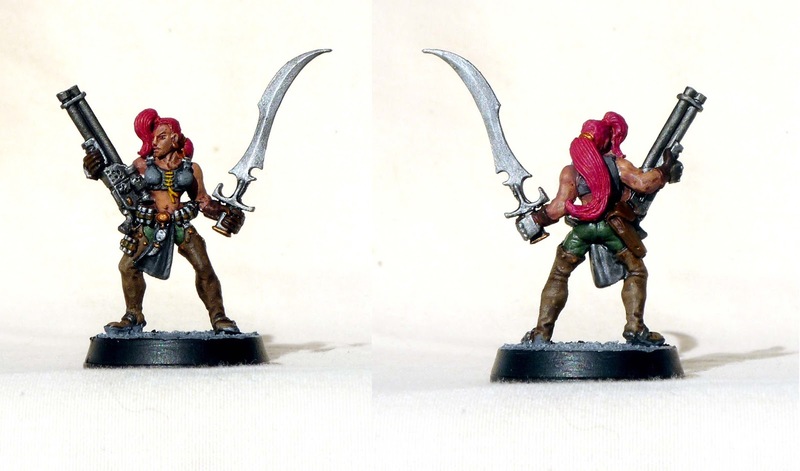 I gave her a quick little conversion- I swapped out her gun for a sword I pulled out of our bits box. I also cut the gun out of one and gave her a flamer. I had forgotten how much more involved doing conversions on metal models is- doing that flamer took forever. The one in the middle has the flamer conversion. There are so many great details on these models, and most of them are unique. The ones in the Escher starter box are all different sculpts, which I absolutely love. The booster pack blisters have random figures in them, but unfortunately the packs I got had the same 3 figures in them. That's what initially prompted me to do some conversion work on them. 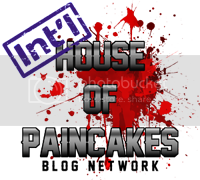 I didn't do anything really fancy, just a little weapon swapping. The backpack of the Heavy on the right is really intricate, I painted that up earlier on in the night, too. The Juve in the middle painted up really fast since she doesn't have as many details as the others, so I was able to finish up two of them in less than an hour. I really like the hair of the one on the left, I used Hawk Turquoise for the hair and gold for the bands. It looks really sharp. The one in the middle had a gun in her left hand, but I swapped it out for a flail I found in the bits box. I was running out of different looking wild colors for their hair, so I did the Juve on the left in a really light grey, almost white. I love the pose of the one in the middle, and I gave her a Dark Elf bit of armor since she didn't have a loin cloth like the others. It's a nice armored piece. The whole gang together, and ready to kick your face in. Individually these models have a ton of character, but all together they really are a fearsome looking force. I am so, so happy with how they came out. I never would have gotten them done so quickly if it hadn't been for the Iron Painter. I also don't think they would have come out as nicely. Since it was a competition, there were winners for each category, and I won in the warband category. I've never won anything before, so it was really exciting. With them all painted up now, I can't wait to get started on the campaign. This also puts me on a great footing to start 2013, with one of my goals already accomplished. It feels really good to check something off that list. Hammer in the New Year 2013 Success!